For more pictures, see the Dinner and Dance post on the parish news blog. I thought it would be right for me as Parish Priest to give a short off-the-cuff speech of thanks. From memory, this is roughly what I said:I would like to thank Tricia and her team for this wonderful dinner tonight. They have arranged it to raise money for the Catholic Church. This is not a very fashionable cause. 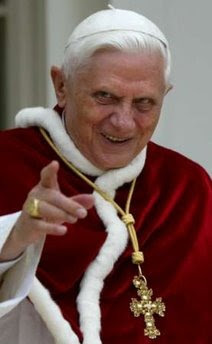 As you know, we in the Catholic Church use our money to hire Opus Dei Albino Monk assassins to kill anyone who tries to prevent us from covering up the fact that Jesus was married to Cleopatra, resulting in a bloodline that leads to Lili Marlene and Michael Jackson. If you are looking for some information about the Motu Proprio in advance of its publication, Fr Z has a summary of points from an article by Andrea Tornielli in Il Giornale. As Fr Z highlights, the permission is expected to extend not only to the old rite of Mass but also the older rites of all the sacraments. First thing today I have to get the newsletter finished by putting in the sermon summary that I do each week. 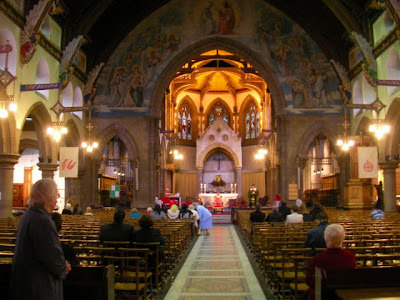 Then I have Mass - our Saturday Latin Mass at the Lady Altar which is popular and a great consolation to me. After that, we have an hour of exposition during which I hear confessions. 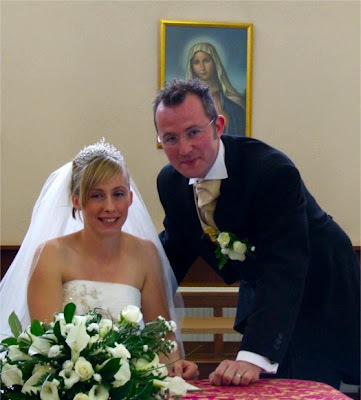 Today, unusually, we have two weddings in the parish. When they are over it will be time for the evening Confessions and then the evening Mass. Fortunately, I have my regular supply priest for that Mass but I always go on to read the notices. Since I am not saying the Mass, I can also be there to see people as they come out of the Church. 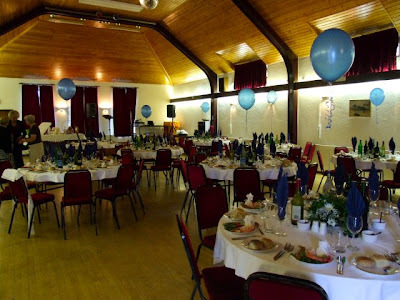 Once that is finished, I am off to the a Parish Dinner and Dance, a new initiative from our Lunch Club. For this we are using the Hall of my next-door neighbour, Fr Francis Hartley at St John Fisher, Bexley. 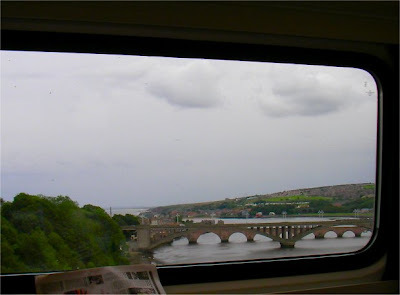 Writing this post, I am 'oop North, being on a train that is just pulling into Newcastle. I will then leave the North and enter Scotland. The GNER train is one of those that goes at a hundred and whatnot miles per hour with the tea only just staying in the cup. Pleased to find that there is free wifi on the train. When it works, it is great but it can be a little erratic. My destination is Edinburgh where I will be attending the Ordination of Kevin Douglas at the Cathedral. I'm sure many of the best people will be there - after all, what better country than Scotland for a gathering of the clans? 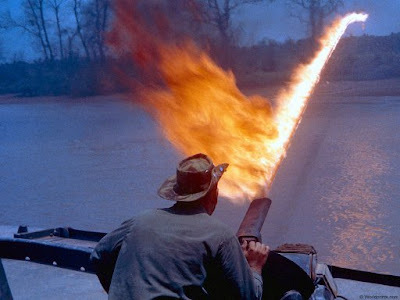 Andrew (Unam Sanctam) has a superb illustrated post about the Vietnamese martyrs who underwent some of the worst tortures in the history of Christian martyrdom - which is saying something. As well as torture, there was forced indignity. From 1832 Minh-Mang excluded all foreign missionaries and ordered Vietnamese Christians to renounce Christianity by trampling on the crucifix. 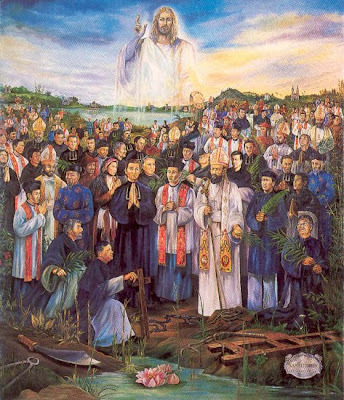 There is a single feast day for all the Vietnamese Martyrs - 117 were particularly named by Pope John Paul II but there were in excess of 130,000 who gave their lives for the faith from 1516 to the 20th century. 8000 Vietnamese in exile participated in the canonisation on 9 June 1988 as representatives for their catholic countrymen in Vietnam, who not were allowed to leave the country. Fr Z gives us the lowdown on the final approach. This afternoon, Cardinal Bertone gave the Motu Proprio to 30 Bishops from around the world. The report is from Kath.Net and here is a partial translation. 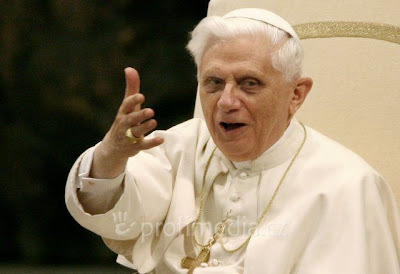 The purpose of giving the translation to selected Bishops is to allow them to have the document before the press. This is wise and just on the part of the Holy Father. We can expect more leaks over the next week or so but this is surely a good way of managing publicity. Richard Marsden has photos of the floods yesterday in the North of England and particularly in his hometown of Hull. Say a prayer especially for the poor man who was drowned after his foot was trapped in a manhole. Please also remember all those whose homes were flooded. Fr Z draws our attention to an editorial in this week's Tablet. It seems to be a reply to the editorial in the Catholic Herald which expressed a sensible support for the Holy Father's forthcoming Motu Proprio on the Classical Rite of Mass. His trenchant critique is well worth reading. Amy Wellborn today has an extract from a very good review of Christopher Hitchen's anti-God book. The review is by Ross Douhat from the Claremont Institute. See Lord Have Mercy for the full text. Another extract, from the Wall Street journal, reminds us why we should be bothered to take issue with the book. Paul, a reader, sent me this text from the Northampton Diocesan Magazine "The Vine" (No 210, July 2007)"Old Rite Finds Home"
Dwight Longenecker asked a number of Latin Mass questions. (His questions clearly refer to the Classical Rite.) I very much respect his protestation that these are "genuine and serious questions". Indeed they are often asked by good orthodox Catholics who do not see the point of the Classical Rite. It is useful for him to gather them together. Shawn Tribe at the New Liturgical Movement in his post Fr Dwight Longenecker's Latin Questions has given considered and respectful answers to them. This makes for a most useful resource. Many thanks to Shawn for is work on this. From a priest's point of view, I would also counsel any priest who is interested to learn to say the Classical Rite. "Pastoral reasons" would give most good priests a solid reason to do so. There is nothing like the experience of celebrating Mass in the Classical Rite to convince a priest of its value. I speak from experience. THE DISAPPEARANCE of a controversial preacher styled “John the Baptist”, the leader of a fringe religious group, has become the focus of a scandal that could threaten the government of King Herod. 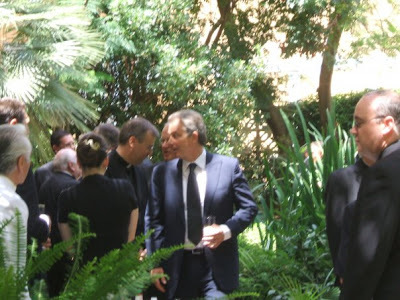 Tony Blair was entertained to lunch at the Venerable English College in Rome today as widely rumoured during the past week. Here are some photos. Here we are in the College garden. On the left, next to Mr Blair is Mgr Nicholas Hudson, Rector of the English College. The priest on the right of the picture is Mgr Andrew Summersgill. 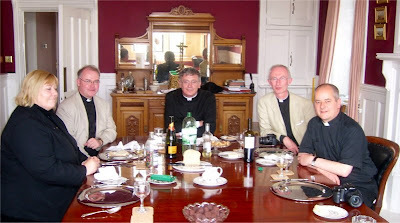 And then in the College Refectory, next to Archbishop Dominique Mamberti, Secretary for Relations with States. Comments that will be published include: discussion of the meaning of this visit, the consequences and impact of it. The case is being brought under Article 9 of the European Convention on Human Rights which reads:1. Everyone has the right to freedom of thought, conscience and religion; this right includes freedom to change his religion or belief, and freedom, either alone or in community with others and in public or private, to manifest his religion or belief, in worship, teaching, practice and observance. 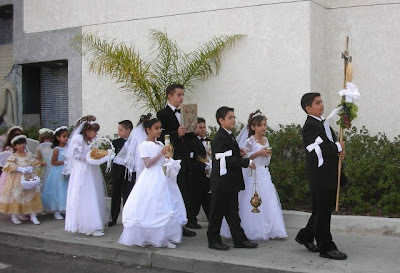 Diane (Te Deum) is doing a series of posts on the altar boy training programme at the Assumption Grotto Church in Detroit, run by Fr Edward Perrone. 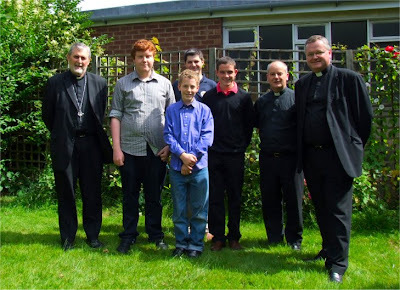 Here is the list with links to the posts already written:All Male ProgramMasculinity of Discipline and Precision RequiredHeaded by the PastorLiturgically traditional parish with orthodoxy in doctrineStrong Catholic identity within the familyLarge homeschooling populationThis programme will result in priestly vocations, have no doubt. I am getting a little edgy about comments where an individual is named and then subjected to strong criticism. I know people have strong views but by and large, I would prefer not to have personal attacks on the blog unless there is a very clear public interest. We have to avoid detraction as well as calumny. Someone asked about the canon law relating to concerts held in Churches. Canon 1210 says:"In a sacred place only those things are to be permitted which serve to exercise or promote worship, piety and religion. Anything out of harmony with the holiness the place is forbidden. The Ordinary may, however, for individual cases, permit other uses, provided they are not contrary to the sacred character of the place. "There is also a 1987 declaration by the Congregation for Divine Worship and the Discipline of the Sacraments on "Concerts in Churches". Having taken a very slow train down to Brighton, we were alerted to the advantage of taking a fast train up again to Victoria. Arriving in the Piazza at about twenty to seven, there were already some good people saying the Rosary and displaying banners with scripture texts. The concert singing the 99 names of Allah was subject to strict security with a mobile "airport security" style screening tent. The police kindly provided a corral for us to use for our prayers. Mgr. Mark Langham, Administrator of Westminster Cathedral explains the background to the concert and Sir John Tavener's composition. 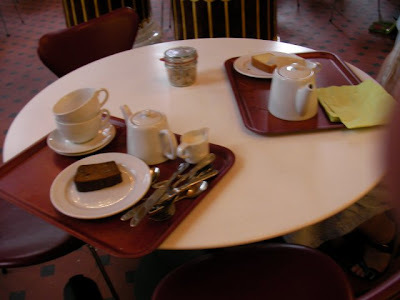 [...]Well we know that Mgr Langham has a blog Solomon I Have Surpassed Thee about Westminster Cathedral and a google/blogger profile Administrator. Therefore what has happened here is that some lackey ("anonymous") has been asked to spam the press release round to various blogs. Thank you for that. Do feel free to reply, readers, if you wish. This received in the combox today from Tim Shamoon:Despite everything that we have gone through we will increase and multiply. We Chaldeans are proud of heritage and of culture. We speak an ancient language derived from the time of our Lord Jesus Christ. We will not be wiped out by a bunch of psychopaths determined to cause terror and drive us of our land. Christianity was started in what is now Iraq by St. Thomas while he was on India. We will survive with the help of the Holy Spirit. Gosh but was today a bit frantic! An early Mass for a deceased person, followed by binning most of my post and dealing with some of it, finalising the talk for tonight and then motoring off to Parkminster. The M25 was ghastly today and despite leaving early, I arrived 15 minutes late, just as the Novice Master was about to give up on me. DeoGratias! If he had sent the novices and simply professed back to their cells, it would have taken ages for them all to gather again. The inaccuracy of so many press comments about the Classical Rite is now so commonplace that it is boring to draw attention to it all the time. Allow me just one example from the Telegraph article I mentioned yesterday. To save labouring the point, I will just put comments into the text:The Tridentine Rite, which dates back to the 1560 Council of Trent, [no - the Council of Trent took place at various stages between 1545 and 1563. The Missal of Pius V was published in 1570 and it was simply a codification of the existing Roman Rite which was already in many essentials over a thousand years old then and was the most ancient of the rites then in use] differs from the new Mass in that it is [always] celebrated in Latin with the priest leading the people in facing east, the direction from which the Church believes Jesus will appear on the Last Day. The Daily Telegraph today has a report titled Catholic bishops resist advance of Latin Mass. The key point:In a confidential letter, the Cardinal, the head of the Church in England and Wales, has argued that the provision of the Old Rite was already adequate in this country.Adequate for whom? one might ask. 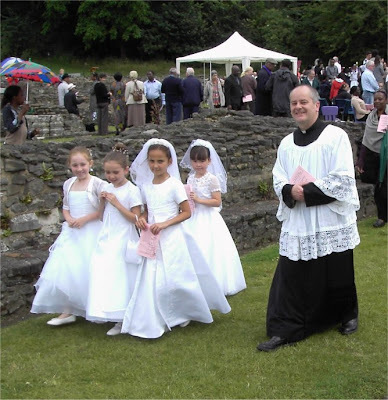 In many places, restrictive permission for the Classical Rite means that people have to go to Sunday Mass at 4pm, or travel to different Churches each Sunday, or have to find priests from the FSSP, the ICKSP or the Archdiocese of Southwark who are willing to travel. Many simply have no provision at all. Several blogs have already pointed out the inconsistency between this letter and the active negotiations which secured approved status for the Gay Mass at Warwick Street, Soho. 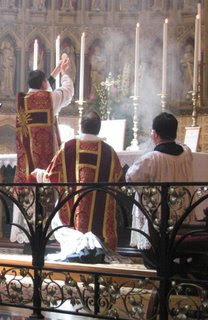 The Latin Mass Society is organising a residential training conference at Merton College, Oxford from Tuesday 28 – Thursday 30 August 2007 for priests ordained within the last ten years to learn the Traditional Latin Rite. Information packs have already been sent to over 400 priests. There will be three days of intensive practical training sessions, guided by priests who regularly celebrate the Traditional Mass, and supported by lectures on the Latin, history and doctrine of the Mass. 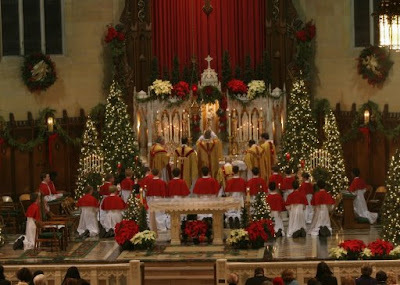 There will also be a full schedule of daily Traditional Mass, Lauds, Vespers and Benediction. Over at the New Liturgical Movement, there is a set of photos of St Marien in Berlin. The first shows the Church in the late 19th century. The second shows the Church after a 1960s aggiornamento which involved whitewash but thankfully did not destroy the Church too radically. The third shows the recent restoration after the Church came into private hands. The notes by Shawn Tribe interpreting this as an allegory of the reform of the reform are well worth reading. Chronicle of a "Renovation of the Renovation"; an Allegory for a Reform of the Reform? Having shown so much interest in the Motu Proprio, I though I had better have a post on the latest information. See this Rorate Caeli post which has the translation of an Italian article at the Papal News website Petrus by Bruno Volpe. Apparently the MP is to be published before the Pope's summer vacation. When is that? you ask. 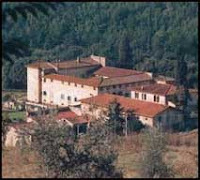 "New Catholic" helpfully specifies:The Pope's vacation this summer will take place in a small villa owned by the Diocese of Treviso, in the tiny hamlet of Lorenzago di Cadore, Province of Belluno, in the Veneto region, in the July 9-27 period.In an interesting detail, the report says that the MP[...] will be presented in a Press Conference by Cardinals Francis Arinze, Dario Castrillon Hoyos, and Julian Herranz.The report has a quotation from the excellent Fr Nicola Bux who spoke at launch of Fr Michael Lang's Turning Towards the Lord in Rome in April last year. A very interesting article on Zenit in which Fr Robert Christian, a theology professor at the Angelicum in Rome shares emails he received from Father Ragheed Ganni who was recently shot in Mosul. (See Christian Martyrs in Iraq) Fr Christian says:"We are used to teaching future leaders of the Church. When we hear about one of our former students becoming a bishop, we rejoice. But having taught a martyr is something else entirely. And sometimes we professors learn from our students. "He is in good company. 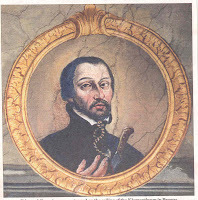 A former professor at his rival university, now called the Gregorian, then called the Roman College, was St Robert Bellarmine. 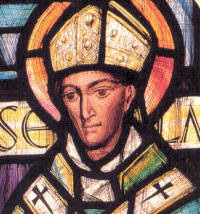 He taught a number of priests from the English College who died for the faith. Previously, a charity could be formed under the head of "Advancement of Religion" and that was taken as a charitable purpose. The 2006 Act introduced a new requirement that the charity must show that it is for the public benefit. It was always that case that a particular religion could be deemed not to be a charity but the legal position now is that no religion is deemed to be a charity ipso facto, there must be a demonstration of something else called "public benefit". Public benefit is not defined in the Act and it has been left for the Charities Commission to consult on the matter. On this, see my previous post Charities Act and the secularist agenda which offers some analysis of the consultation process.